ww2dbaseThe aircraft later known as USS Wasp (CV-18) was originally laid down under the name of Oriskany, but the name was changed before launch after the loss of the previous USS Wasp (CV-7) which took place in Sep 1942. The new USS Wasp was commissioned into service in Nov 1943 with Captain Clifton A. F. Sprague in command and served off the east coast of the United States until early Mar 1944, when she set sail for Pearl Harbor, US Territory of Hawaii. Her air group's first combat operation was conducted against Japanese positions on Marcus and Wake Islands in May 1944, and shortly after the group would see action over the Mariana Islands in support of the invasion; in the latter action, she would participate in the Battle of the Philippine Sea. After a brief rest at Eniwetok, Marshall Islands in Jun 1944, she sailed with other carriers to attack Japanese positions in the Bonin Islands, Palau Islands, and Mariana Islands; at Mariana Islands on 21 Jul 1944, her aircraft provided aerial cover for the invasion of Guam. In Sep 1944, she supported the Palau Islands invasion by attacking Japanese targets at the Palau Islands and in the Philippine Islands. By Oct, Task Force 38, which USS Wasp was a part of, would be striking Japanese positions on Taiwan and northern Philippine Islands. In Dec, her aircraft struck targets in the Philippine Islands, in the Ryukyu Islands, and on Taiwan. By Feb 1945, her aircraft were operating over the Japanese Home Islands. The period between 17 and 23 Mar 1945 would later be known as her busiest week, as her air group shot down 14 Japanese aircraft, destroyed six aircraft on the ground, scored five 500-pound (230-kilogram) and four 1,000-pound (450-kilogram) bomb hits on naval vessels, and damaged a submarine by strafing; from a defensive stance, her anti-aircraft gunners expended more than 10,000 rounds fending off attacking Japanese aircraft during this period. After a brief time at Puget Sound Navy Yard, Bremerton, Washington, United States for repairs, she returned to waters off Japan in late Jul 1945, where she would be when the war ended. In the immediate days after WW2, she transported Italian prisoners of war from United States to Italy. She was placed into the Atlantic Reserve Fleet in 1947.
ww2dbaseIn the summer of 1948, USS Wasp was taken out of the reserve fleet for modernization. She was recommissioned on 10 Sep 1951 with jets aboard her flight deck. Between 1952 and 1972, she saw service in the Atlantic Ocean, Caribbean Sea, Gulf of Mexico, Mediterranean Sea, and the Pacific Ocean; hosted dignitaries such as President Chiang Kaishek of the Republic of China and President Ramon Magsaysay of the Republic of the Philippines; participated in the recovery of American astronauts, and visited ports as far ranging as Yokosuka in Japan, Beirut in Lebanon, and Plymouth in the United Kingdom. She was decommissioned for the second and final time in 1972, and was sold for scrapping in the following year. 18 Mar 1942 The keel of Oriskany was laid down at Bethlehem Steel Company's Fore River Shipyard, Quincy, Massachusetts, United States. 13 Nov 1942 Carrier Oriskany was renamed Wasp while still under construction at Bethlehem Steel Company's Fore River Shipyard, Quincy, Massachusetts, United States. 17 Aug 1943 Wasp was launched at Bethlehem Steel Company's Fore River Shipyard, Quincy, Massachusetts, United States, sponsored by Miss Julia M. Walsh, the sister of US Senator David I. Walsh. 24 Nov 1943 USS Wasp was commissioned into service with Captain Clifton A. F. Sprague in command. 10 Jan 1944 USS Wasp departed Boston, Massachusetts, United States for Hampton Roads off Virginia, United States. 31 Jan 1944 USS Wasp departed Hampton Roads off Virginia, United States for Trinidad. 22 Feb 1944 USS Wasp departed Trinidad. 27 Feb 1944 USS Wasp arrived at Boston, Massachusetts, United States. 21 Mar 1944 USS Wasp arrived at San Diego, California, United States. 4 Apr 1944 USS Wasp arrived at Pearl Harbor, US Territory of Hawaii. 14 May 1944 USS Wasp's aircraft attacked Japanese positions on Marcus and Wake Islands. 19 May 1944 USS Wasp's aircraft attacked Japanese positions in support of the upcoming Mariana Islands invasion. 20 May 1944 USS Wasp's aircraft attacked Japanese positions in support of the upcoming Mariana Islands invasion. 21 May 1944 USS Wasp set sail for Wake Island. 24 May 1944 USS Wasp's aircraft attacked Wake Island. 6 Jun 1944 USS Wasp was assigned to US Navy Task Group 58.2. 11 Jun 1944 USS Wasp's aircraft attacked Japanese positions on Saipan and Tinian in the Mariana Islands. 12 Jun 1944 USS Wasp's aircraft attacked Japanese positions on Saipan and Tinian in the Mariana Islands. 13 Jun 1944 USS Wasp's aircraft attacked Japanese positions on Saipan and Tinian in the Mariana Islands. 21 Jun 1944 USS Wasp was attached to Willis Lee's battleship group, which was sent in pursuit of the retreating Japanese ships after the Battle of the Philippine Sea. The group would fail to find any targets. 23 Jun 1944 USS Wasp set sail for Eniwetok, Marshall Islands. 30 Jun 1944 USS Wasp departed Eniwetok, Marshall Islands. 3 Jul 1944 USS Wasp's aircraft attacked Japanese positions on Iwo Jima and Chichi Jima of the Bonin Islands. 4 Jul 1944 USS Wasp's aircraft attacked Japanese positions on Iwo Jima and Chichi Jima of the Bonin Islands. 5 Jul 1944 USS Wasp's aircraft attacked Japanese positions on Guam and Rota of the Mariana Islands. 21 Jul 1944 USS Wasp's aircraft provided aerial cover for the invasion of Guam, Mariana Islands. 22 Jul 1944 USS Wasp set sail for the Caroline Islands. 25 Jul 1944 USS Wasp's aircraft attacked Japanese positions in the Palau Islands. 2 Aug 1944 USS Wasp arrived at Eniwetok, Marshall Islands. 28 Aug 1944 USS Wasp departed Eniwetok, Marshall Islands. 6 Sep 1944 USS Wasp's aircraft attacked Japanese positions in the Palau Islands. 7 Sep 1944 USS Wasp's aircraft attacked Japanese positions in the Palau Islands. 8 Sep 1944 USS Wasp's aircraft attacked Japanese positions in the Palau Islands. 9 Sep 1944 USS Wasp's aircraft attacked Japanese positions on Mindanao, Philippine Islands. 10 Sep 1944 USS Wasp's aircraft attacked Japanese positions on Mindanao, Philippine Islands. 12 Sep 1944 USS Wasp's aircraft attacked Japanese positions in central Philippine Islands. 13 Sep 1944 USS Wasp's aircraft attacked Japanese positions in central Philippine Islands. 15 Sep 1944 USS Wasp supported the Palau Islands invasion from the position 80 kilometers off Morotai, Maluku Islands. 29 Sep 1944 USS Wasp arrived at Manus, Admiralty Islands. 4 Oct 1944 USS Wasp departed Manus, Admiralty Islands. 7 Oct 1944 USS Wasp made rendezvous with Task Force 38 in the Philippine Sea in the evening. 8 Oct 1944 USS Wasp refueled from an oiler in the Philippine Sea. 10 Oct 1944 USS Wasp's aircraft attacked positions on Okinawa, Anami, and Miyaki of the Ryukyu Islands, Japan. 12 Oct 1944 Aircraft from USS Wasp attacked the Okayama Airfield north of Takao (now Kaohsiung), Taiwan. Nearby targets of opportunity such as the seaplane base at Toko Bay (now Dapeng Bay), the naval port at Toshien (now Zuoying), and the Japanese Army airfield at present-day Kaohsiung International Airport were also attacked. 18 Oct 1944 USS Wasp's aircraft attacked Japanese positions on Luzon, Philippine Islands. 19 Oct 1944 USS Wasp's aircraft attacked Japanese positions on Luzon, Philippine Islands; Manila was attacked by US aircraft for the first time. 20 Oct 1944 USS Wasp's aircraft supported the US landings on Leyte, Philippine Islands. 21 Oct 1944 USS Wasp refueled off Philippine Islands. 22 Oct 1944 USS Wasp set sail for Ulithi, Caroline Islands. 28 Oct 1944 USS Wasp departed waters off Philippine Islands for Ulithi, Caroline Islands. 5 Nov 1944 USS Wasp's aircraft attacked Japanese airfields on Luzon, Philippine Islands. 6 Nov 1944 USS Wasp's aircraft attacked Japanese airfields on Luzon, Philippine Islands. 26 Nov 1944 USS Wasp set sail for Ulithi, Caroline Islands as US Army Air Forces took over the responsibility of providing air cover for troops operating on Leyte, Philippine Islands. 10 Dec 1944 USS Wasp departed Ulithi, Caroline Islands. 14 Dec 1944 USS Wasp's aircraft attacked Japanese airfields on Luzon, Philippine Islands. 15 Dec 1944 USS Wasp's aircraft attacked Japanese airfields on Luzon, Philippine Islands. 16 Dec 1944 USS Wasp transited the Luzon Strait north of the Philippine Islands. 16 Dec 1944 USS Wasp's aircraft attacked Japanese airfields on Luzon, Philippine Islands. 21 Dec 1944 USS Wasp's aircraft attacked Japanese positions on Taiwan and in the Ryukyu Islands. 26 Dec 1944 USS Wasp arrived at Ulithi, Caroline Islands. 3 Jan 1945 18 F6F-5 fighters of Air Group 81 from USS Wasp attacked Koryu Airfield in Taiwan with rockets, bombs, and strafing; no Japanese fighters rose to defend. These attacking fighters regrouped over Taiwan Strait after the attack, flew back over Taiwan, and attacked targets of opportunity; they sank a small fishing boat along the coast, destroying a cargo train (carrying oil) at present day Dashan Station of Houlong Township, and heavily damaging a 10-car passenger train further northeast. A separate group of 4 F6F-5 fighters of the same air group conducted a photographic reconnaissance mission over Koryu Airfield, Shinchiku Airfield, and Koko Airfield in Taiwan. 16 Feb 1945 USS Wasp's aircraft conducted a fighter sweep over Japan; several fighters were lost in the ensuing engagement. 19 Feb 1945 USS Wasp's aircraft provided aerial cover for the Iwo Jima, Japan invasion. 23 Feb 1945 USS Wasp's aircraft attacked targets in the Tokyo, Japan area. 24 Feb 1945 USS Wasp's aircraft launched to attack targets in the Nagoya, Japan area, but the mission was canceled due to poor weather. 1 Mar 1945 USS Wasp's aircraft attacked and photographed Japanese positions in the Ryukyu Islands. 4 Mar 1945 USS Wasp arrived at Ulithi, Caroline Islands. 13 Apr 1945 USS Wasp arrived at Puget Sound Navy Yard, Bremerton, Washington, United States. 12 Jul 1945 USS Wasp departed Pearl Harbor, US Territory of Hawaii. 18 Jul 1945 USS Wasp launched Carrier Air Group Eighty Six aircraft against Wake Island. 9 Aug 1945 USS Wasp was nearly hit by a Japanese special attack aircraft off Japan. 15 Aug 1945 USS Wasp fired her anti-aircraft guns at attacking Japanese aircraft for the final time in the war. 25 Aug 1945 USS Wasp sailed through a typhoon in the Pacific Ocean. 27 Oct 1945 USS Wasp arrived at Boston, Massachusetts, United States. 30 Oct 1945 USS Wasp arrived at New York Navy Yard, Brooklyn, New York, United States, where she would receive minor conversion work to accommodate 400 officer and 5,000 men. 15 Nov 1945 USS Wasp departed New York Navy Yard, Brooklyn, New York, United States. 17 Apr 1946 USS Wasp accidentally ran aground off New Jersey, United States. 17 Feb 1947 USS Wasp was decommissioned from service. 28 Sep 1951 USS Wasp was recommissioned into service. 26 Apr 1952 USS Wasp collided with minesweeper USS Hobson in the Atlantic Ocean; 176 were killed aboard Hobson, while Wasp suffered a 75-foot rip on her bow. 2 Jun 1952 USS Wasp arrived at Gibraltar and joined Carrier Division 6. 5 Sep 1952 USS Wasp was removed from Carrier Division 6 while at Gibraltar. 1 Oct 1952 USS Wasp was redesignated an attack carrier, CVA. 13 Oct 1952 USS Wasp arrived at Norfolk, Virginia, United States. 7 Nov 1952 USS Wasp entered New York Naval Shipyard, Brooklyn, New York, United States. 16 Sep 1953 USS Wasp departed Norfolk, Virginia, United States. 10 Jan 1954 USS Wasp hosted President Chiang Kaishek of the Republic of China off Taiwan. 12 Mar 1954 USS Wasp hosted President Ramon Magsaysay of the Republic of the Philippines off Subic Bay, Philippine Islands. 1 Dec 1955 USS Wasp completed a seven-month overhaul at San Francisco Naval Shipyard, California, United States. 3 Apr 1956 USS Wasp departed San Diego, California, United States with Carrier Air Group 15 aboard. 14 May 1956 USS Wasp arrived at Guam. 4 Jun 1956 USS Wasp arrived at Yokosuka, Japan. 15 Oct 1956 USS Wasp arrived at San Diego, California, United States. 1 Nov 1956 USS Wasp was redesignated an antisubmarine warfare aircraft carrier, CVS, while at San Diego, California, United States. 31 Jan 1957 USS Wasp departed San Diego, California, United States. 21 Mar 1957 USS Wasp arrived at Boston, Massachusetts, United States. 6 Apr 1957 USS Wasp arrived at Norfolk, Virginia, United States. 16 Aug 1957 USS Wasp arrived at Boston, Massachusetts, United States. 3 Sep 1957 USS Wasp departed Boston, Massachusetts, United States for Scotland, United Kingdom to participated in NATO Operations Seaspray and Strikeback. 23 Oct 1957 USS Wasp arrived at Boston Naval Shipyard, Massachusetts, United States for a major overhaul. 10 Mar 1958 USS Wasp completed a major overhaul at Boston Naval Shipyard, Massachusetts, United States. 29 Apr 1958 USS Wasp arrived at Boston, Massachusetts, United States. 12 May 1958 USS Wasp was assigned to Task Force 66 of US Navy 6th Fleet and departed Boston, Massachusetts, United States. 21 May 1958 USS Wasp arrived at Gibraltar. 15 Jul 1958 USS Wasp set sail for waters off Lebanon. 20 Jul 1958 USS Wasp launched US Marine transport helicopters while off Lebanon; the helicopter brought US Marines to Beirut International Airport. 17 Sep 1958 USS Wasp departed Beirut, Lebanon. 7 Oct 1958 USS Wasp arrived at Norfolk, Virginia, United States. 11 Oct 1958 USS Wasp arrived at Boston, Massachusetts, United States. 15 Oct 1958 USS Wasp became flagship of Task Group Bravo of US Navy Atlantic Fleet while at Boston, Massachusetts, United States. 26 Nov 1958 USS Wasp departed Naval Air Station Quonset Point, Rhode Island, United States. 13 Dec 1958 USS Wasp arrived at Boston, Massachusetts, United States. 18 Aug 1959 An accidental explosion and fire aboard USS Wasp briefly threatened the nuclear weapons aboard the carrier while she was sailing 250 miles east of Norfolk, Virginia, United States; the fires were eventually contained and extinquished. 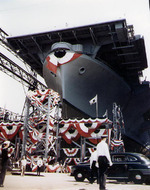 27 Feb 1960 USS Wasp entered Boston Naval Shipyard, Massachusetts, United States for overhaul. 11 Aug 1960 USS Wasp arrived at Boston, Massachusetts, United States. 10 Dec 1960 USS Wasp arrived at Boston, Massachusetts, United States. 9 Jan 1961 USS Wasp departed Boston, Massachusetts, United States for the Virginia Capes to the south. 9 Jun 1961 USS Wasp departed Norfolk, Virginia, United States for the Mediterranean Sea. 1 Sep 1961 USS Wasp arrived at Boston, Massachusetts, United States. 6 Nov 1961 USS Wasp completed overhaul at Boston Naval Shipyard, Massachusetts, United States. 11 Jan 1962 USS Wasp began a period of anti-submarine warfare exercises off the east coast of the United States. 18 Jan 1962 USS Wasp completed a period of anti-submarine warfare exercises off the east coast of the United States. 24 Jan 1962 USS Wasp arrived at waters off Bermuda. 31 Jan 1962 USS Wasp departed from waters off Bermuda for Boston, Massachusetts, United States. 18 Feb 1962 USS Wasp departed Boston, Massachusetts, United States. 1 Mar 1962 USS Wasp arrived at Portsmouth, England, United Kingdom. 16 Mar 1962 USS Wasp arrived at Rotterdam, the Netherlands. 22 Mar 1962 USS Wasp arrived at Greenock, Scotland, United Kingdom. 30 Mar 1962 USS Wasp departed Greenock, Scotland, United Kingdom. 17 Apr 1962 Captain W. F. Brewer of USS Wasp presented Lord Mayor Alderman A. Goldberg of Plymouth, England, United Kingdom a large picture of Mayflower II from the people of Plymouth, Massachusetts, United States. 5 May 1962 USS Wasp arrived at Kiel, West Germany; she became the first carrier to visit Kiel. 16 Jun 1962 USS Wasp arrived at Boston, Massachusetts, United States. 1 Nov 1962 USS Wasp was ordered to participate in the blockade of Cuba. 14 Nov 1962 Carrier USS Wasp and destroyer USS Holder collided while refueling off Cuba. 22 Nov 1962 USS Wasp arrived at Boston, Massachusetts, United States. 21 Dec 1962 USS Wasp departed Boston, Massachusetts, United States for Bermuda with 18 midshipmen from Boston area universities. 29 Dec 1962 USS Wasp arrived at Boston, Massachusetts, United States. 4 Apr 1963 USS Wasp arrived at Boston, Massachusetts, United States after participating in fleet exercises off Puerto Rico. 11 May 1963 USS Wasp arrived off Bermuda to serve as a backup recovery ship for the Mercury space capsule recovery. 18 May 1963 USS Wasp departed waters off Bermuda. 4 May 1964 USS Wasp arrived at Boston, Massachusetts, United States. 14 May 1964 USS Wasp departed Boston, Massachusetts, United States for waters between Guantanamo Bay, Cuba, and Kingston, Jamaica for a refresher training cruise. 3 Jun 1964 USS Wasp arrived at Boston, Massachusetts, United States. 21 Jul 1964 USS Wasp departed Boston, Massachusetts, United States for Norfolk, Virginia, United States. 7 Aug 1964 USS Wasp arrived at Boston, Massachusetts, United States. 8 Sep 1964 USS Wasp departed Boston, Massachusetts, United States for Virginia, United States, where she would set sail for Valencia, Spain to start a tour in the Mediterranean Sea. 18 Dec 1964 USS Wasp arrived at Boston, Massachusetts, United States. 8 Feb 1965 USS Wasp departed Boston, Massachusetts, United States for fleet exercises in the Caribbean Sea. 7 Jun 1965 USS Wasp recovered Gemini IV astronauts and their spacecraft off the east coast of the United States. 20 Aug 1965 USS Wasp hosted 12 United States Congressmen. 21 Aug 1965 USS Wasp hosted 12 United States Congressmen. 16 Dec 1965 USS Wasp began a mission to recover astronauts of Gemini VI and VII. 18 Dec 1965 USS Wasp completed a mission to recover astronauts of Gemini VI and VII. 22 Dec 1965 USS Wasp arrived at Boston, Massachusetts, United States. 24 Jan 1966 USS Wasp departed Boston, Massachusetts, United States for exercises off Puerto Rico. 27 Jan 1966 USS Wasp suffered structural damage during a storm in the Caribbean Sea. 1 Feb 1966 USS Wasp entered Roosevelt Roads Naval Base in Puerto Rico to evaluate damages caused by a storm. 6 Feb 1966 USS Wasp began a period of anti-submarine operations off Puerto Rico. 8 Feb 1966 USS Wasp began a period of anti-submarine operations off Puerto Rico. 18 Feb 1966 USS Wasp arrived at Boston, Massachusetts, United States to receive repairs for damages caused by a storm in late Jan 1966. 7 Mar 1966 USS Wasp's repairs of storm damage were completed at Boston, Massachusetts, United States. 21 Mar 1966 USS Wasp embarked a television film crew from the National Broadcasting Company. 24 Mar 1966 USS Wasp arrived at Boston, Massachusetts, United States. 27 Mar 1966 USS Wasp hosted Austrian Ambassador to the United States Doctor Ernst Lemberger. 18 Apr 1966 USS Wasp embarked US Secretary of the Navy Paul Nitze and departed Boston, Massachusetts, United States for Guantanamo Bay, Cuba. 6 May 1966 USS Wasp arrived at Boston, Massachusetts, United States. 6 Jun 1966 USS Wasp recovered Gemini IX astronauts Lieutenant Colonel Thomas Stafford and Lieutenant Commander Eugene Cernan in the Atlantic Ocean. 20 Jun 1966 USS Wasp participated in the ASWEX III anti-submarine exercise in the Atlantic Ocean. 1 Jul 1966 USS Wasp completed the ASWEX III anti-submarine exercise and returned to Boston, Massachusetts, United States. 25 Jul 1966 USS Wasp departed Boston, Massachusetts, United States for ASWEX IV anti-submarine exercise. 5 Aug 1966 USS Wasp completed the ASWEX IV anti-submarine exercise in the Atlantic Ocean. 8 Aug 1966 USS Wasp departed Boston, Massachusetts, United States on a Dependents' Day Cruise for the family of the servicemen. 9 Aug 1966 USS Wasp arrived at Boston, Massachusetts, United States, completing a Dependents' Day Cruise for the family of the servicemen. 10 Aug 1966 USS Wasp conducted a orientation cruise out of Boston Massachusetts, United States. 11 Aug 1966 USS Wasp conducted a orientation cruise out of Boston Massachusetts, United States. 22 Aug 1966 USS Wasp conducted a orientation cruise out of Boston Massachusetts, United States. 1 Sep 1966 USS Wasp arrived at Boston, Massachusetts, United States. 19 Sep 1966 USS Wasp departed Boston, Massachusetts, United States for a joint hunter-killer operation exercise with aircraft of Royal Canadian Navy in the Atlantic Ocean. 4 Oct 1966 USS Wasp completed a joint hunter-killer operation exercise with aircraft of Royal Canadian Navy in the Atlantic Ocean. 5 Nov 1966 USS Wasp departed Boston, Massachusetts, United States for the Gemini XII recovery operation. 15 Nov 1966 USS Wasp recovered astronauts Captain James Lovell and Major Edwin Aldrin of the Gemini XII space program in the Atlantic Ocean. 18 Nov 1966 USS Wasp arrived at Boston, Massachusetts, United States, ending the Gemini XII recovery operation. 28 Nov 1966 USS Wasp departed Boston, Massachusetts, United States for the Lantflex-66 fleet exercise. 16 Dec 1966 USS Wasp arrived at Boston, Massachusetts, United States. 24 Jan 1967 USS Wasp began serving as a carrier qualification duty ship for the Naval Air Training Command in the Gulf of Mexico and off the east coast of Florida, United States. 4 Feb 1967 USS Wasp arrived at New Orleans, Louisiana, United States. 8 Feb 1967 USS Wasp departed New Orleans, Louisiana, United States. 11 Feb 1967 USS Wasp arrived at Pensacola, Florida, United States. 12 Feb 1967 USS Wasp departed Pensacola, Florida, United States. 19 Feb 1967 USS Wasp arrived at Mayport, Florida, United States. 20 Feb 1967 USS Wasp departed Mayport, Florida, United States. 26 Feb 1967 USS Wasp arrived in Boston, Massachusetts, United States. 19 Mar 1967 USS Wasp departed Boston, Massachusetts, United States for Springboard operations in the Caribbean Sea. 24 Mar 1967 While refueling, carrier USS Wasp collided with oiler USS Salamonie in the Atlantic Ocean; Wasp would set sail for Roosevelt Roads Naval Base in Puerto Rico for repairs. 29 Mar 1967 USS Wasp completed her repairs at Roosevelt Roads Naval Base in Puerto Rico. 30 Mar 1967 USS Wasp arrived at the US Virgin Islands. 2 Apr 1967 USS Wasp departed the US Virgin Islands. 7 Apr 1967 USS Wasp arrived in Boston, Massachusetts, United States. 11 Apr 1967 USS Wasp departed Boston, Massachusetts, United States for Naval Weapons Station Earle in New Jersey, United States. 21 Apr 1967 USS Wasp arrived at Boston Naval Shipyard, Massachusetts, United States for a scheduled overhaul. 10 Sep 1967 USS Wasp suffered a small fire in the combat information center while in drydock at Boston Naval Shipyard, Massachusetts, United States. 28 Jan 1968 USS Wasp arrived at Boston Naval Shipyard, Massachusetts, United States for post-overhaul repairs. 28 Feb 1968 USS Wasp's crew began a five-week period of refresher training. 30 Mar 1968 USS Wasp set sail for Boston, Massachusetts, United States. 6 Apr 1968 USS Wasp arrived in Boston, Massachusetts, United States for minor repairs. 29 Apr 1968 USS Wasp departed Boston, Massachusetts, United States for the Fixwex C exercise in the Bahamas. 20 May 1968 USS Wasp departed the Bahamas for Jacksonville, Florida, United States. 12 Jun 1968 While refueling, carrier USS Wasp collided with oiler USS Truckee in the Atlantic Ocean; Wasp would set sail for Norfolk, Virignia, United States for evaluation and repairs. 20 Jun 1968 USS Wasp departed Norfolk, Virignia, United States for Boston, Massachusetts, United States. 3 Aug 1968 USS Wasp departed Boston, Massachusetts, United States for Norfolk, Virignia, United States. 10 Aug 1968 USS Wasp arrived at Naval Air Station Quonset Point, Rhode Island, United States. 20 Aug 1968 USS Wasp departed Naval Air Station Quonset Point, Rhode Island, United States for Silvertower NATO exercise in European waters. 25 Oct 1968 USS Wasp entered the Mediterranean Sea. 26 Oct 1968 USS Wasp was assigned to US Navy Task Group 67.6 while in the Mediterranean Sea. 7 Nov 1968 USS Wasp departed Naples, Italy. 19 Dec 1968 USS Wasp arrived at Naval Air Station Quonset Point, Rhode Island, United States. 6 Mar 1969 USS Wasp arrived at Naval Air Station Quonset Point, Rhode Island, United States. 1 Apr 1969 USS Wasp departed Naval Air Station Quonset Point, Rhode Island, United States. 16 Apr 1969 USS Wasp arrived at Lisbon, Portugal. 21 Apr 1969 USS Wasp began her participation in Trilant exercise with Spanish and Portuguese navies. 26 Apr 1969 USS Wasp completed her participation in Trilant exercise with Spanish and Portuguese navies. 15 May 1969 USS Wasp arrived at Portsmouth, England, United States and participated in a NATO naval review presided by Queen Elizabeth and her consort Prince Philip. 30 Jun 1969 USS Wasp departed Europe for the United States. 12 Aug 1969 USS Wasp departed Naval Air Station Quonset Point, Rhode Island, United States for an one-day United Fund cruise. 24 Aug 1969 USS Wasp departed Naval Air Station Quonset Point, Rhode Island, United States. 29 Aug 1969 USS Wasp began a period of carrier qualifications and basic qualifications off Corpus Christi, Texas, United States and Pensacola, Florida, United States. 6 Oct 1969 USS Wasp completed a period of carrier qualifications and basic qualifications off Corpus Christi, Texas, United States and Pensacola, Florida, United States. 10 Oct 1969 USS Wasp began a period of limited availability. 22 Nov 1969 USS Wasp departed the Virginia Capes area on the east coast of the United States. 10 Dec 1969 USS Wasp completed a period of carrier qualifications off Jacksonville, Florida, United States. 13 Dec 1969 USS Wasp arrived at Naval Air Station Quonset Point, Rhode Island, United States. 4 Jan 1970 USS Wasp departed Naval Air Station Quonset Point, Rhode Island, United States for Naval Weapons Station Earle in New Jersey, United States. 9 Jan 1970 USS Wasp entered Boston Naval Shipyard, Massachusetts, United States for a scheduled overhaul. 16 Mar 1970 USS Wasp began a post-overhaul shakedown cruise. 3 Apr 1970 USS Wasp arrived at Naval Air Station Quonset Point, Rhode Island, United States. 7 May 1970 USS Wasp arrived at Lisbon, Portugal for NATO exercise Night Patrol. 8 Jun 1970 USS Wasp arrived at Rota, Spain. 26 Jun 1970 USS Wasp departed Copenhagen, Denmark. 30 Jun 1970 USS Wasp crossed the Arctic Circle in the Norwegian Sea. 13 Jul 1970 USS Wasp arrived at Hamburg, Germany, welcomed by a gathering of 15,000 Germans. 10 Aug 1970 USS Wasp departed Britain for the Norwegian Sea. 28 Aug 1970 USS Wasp arrived at Plymouth, England, United Kingdom. 30 Aug 1970 USS Wasp departed Plymouth, England, United Kingdom. 8 Sep 1970 USS Wasp arrived at Naval Air Station Quonset Point, Rhode Island, United States. 11 Oct 1970 USS Wasp departed Naval Air Station Quonset Point, Rhode Island, United States for Naval Weapons Station Earle in New Jersey, United States. 15 Oct 1970 USS Wasp entered Boston Naval Shipyard, Massachusetts, United States. 14 Dec 1970 USS Wasp exited Boston Naval Shipyard, Massachusetts, United States. 19 Dec 1970 USS Wasp arrived at Naval Air Station Quonset Point, Rhode Island, United States. 14 Jan 1971 USS Wasp departed Naval Air Station Quonset Point, Rhode Island, United States. 20 Jan 1971 Carrier USS Wasp and oiler USS Chukawan collided while refueling southwest of Bermuda. 12 Feb 1971 USS Wasp hosted Secretary of the Navy John Chafee and Vice Admiral Isaac C. Kidd, Jr.
15 Feb 1971 USS Wasp set sail for Gibraltar. 24 Feb 1971 USS Wasp set sail for the United States. 3 Mar 1971 USS Wasp arrived at Naval Air Station Quonset Point, Rhode Island, United States. 27 Apr 1971 USS Wasp departed Naval Air Station Quonset Point, Rhode Island, United States. 3 May 1971 USS Wasp began her participation of exercise Exotic Dancer. 8 May 1971 USS Wasp embarked a television crew from the American Broadcasting Company. 15 May 1971 USS Wasp conducted a Dependents' Day Cruise for the family of the servicemen. 2 Jul 1971 USS Wasp arrived at Naval Air Station Quonset Point, Rhode Island, United States. 26 Aug 1971 USS Wasp arrived at Naval Air Station Quonset Point, Rhode Island, United States. 23 Sep 1971 USS Wasp departed Naval Air Station Quonset Point, Rhode Island, United States for exercise Lantcortex 1-72. 6 Oct 1971 USS Wasp completed her participation in exercise Lantcortex 1-72. 4 Nov 1971 USS Wasp arrived at Naval Air Station Quonset Point, Rhode Island, United States. 8 Nov 1971 USS Wasp departed Naval Air Station Quonset Point, Rhode Island, United States for Newport News Building and Drydock Company drydock facilities in Virginia, United States. 22 Nov 1971 USS Wasp exited from the drydock facilities of Newport News Building and Drydock Company in Virginia, United States. 1 Mar 1972 It was announced that USS Wasp would be decommissioned in the near future. 1 Jul 1972 USS Wasp was decommissioned from service and was struck from the US Naval Register. 21 May 1973 USS Wasp was sold to the Union Minerals and Alloys Corporation of New York, New York, United States for scrapping. I found two photos of the U.S.S. WASP after being recommissioned off the shore of Cuba in January 1952 in my Father's photo book. He took them from the deck of the U.S.S. WITEK (EDD 848). I couldnt find a way to post them here. I remember going to a Christmas party on the WASP in Boston around 1962 I have pictures of this magnificent ship and cherish them. I was only 9 but I remember it well. My Dad was a Chief Petty Officer then.. I served as a Hospital Corpsman on the Wasp from 10/67-2/68 mostly on night duty and sutured a number of Crew with minor lacerations. Made one training cruise to the Caribbean and one COD flight with a patient to Homestead and return. She was primarily a training and ASW carrier at that time. Left her to serve as a combat Corpsman with the Marines. She was a great ship and crew. My uncle, Joseph Alese, served aboard CV 18, the Wasp, in the Pacific during WW2 under Capt Sprauge . He as a CPO in charge of an AA battery; and received commendations for markmanship. He was a proud 'plank owner' and attended many reunions in the 1990's and 1990's.